I’ve been using a Mac now for a fair few years. Probably approaching five years if I sit and think about. It all started when I bought my Mac Mini during my PhD. Well, that was a great purchase and since then I’ve moved on from the Mac Mini to a 27” iMac and a MacBook Air. 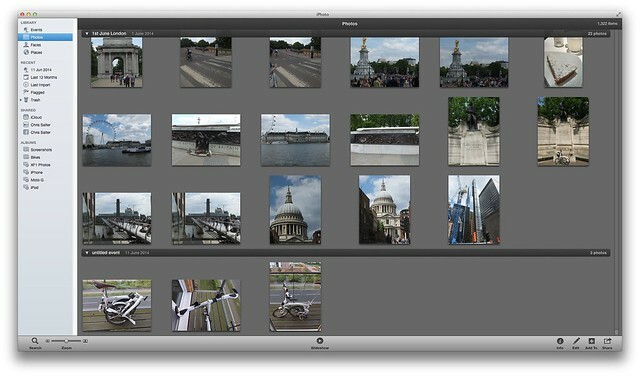 Anyhow, since I started with the Mac, there were a few things that I’ve not used on them - one of which was iPhoto. At the time, I dumped all my pictures into a giant folder so I didn’t consider it worthwhile. However, since I bought a digital camera and I’ve started taking more photos, I’ve begun to change my mind. iPhoto is an Apple app that, I believe, is free in the App Store (though I’m sure it originally used to be included on new Mac’s for free). However, I had access to it through the App Store and that’s how it is on my PC. 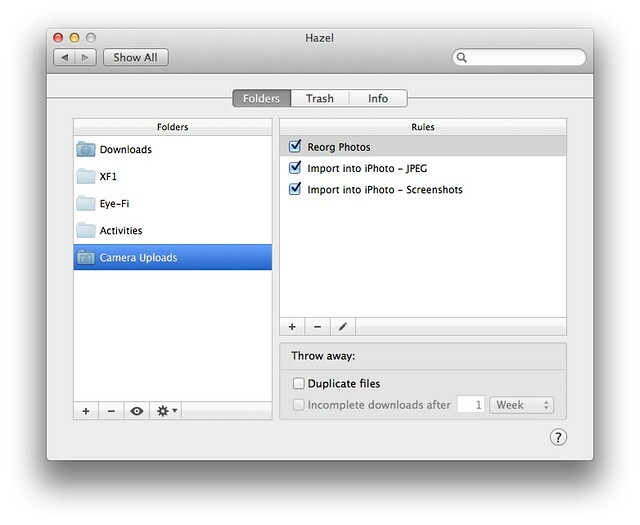 Before getting the camera, I had a long winded and non existent way of importing photos to my PC - basically, I used to rely on the Dropbox app on my phone to upload them to the Dropbox Camera Uploads folder and then my PC would download them, where Hazel would move them to my Photo folder. All of this on the basis of I didn’t have a digital camera and I didn’t take to many pictures. However, I recently wrote an article for Micro Mart where I investigated the file system and our relationship with it (as an iOS user, I was fully aware that often I would never interact with the filesystem). I pointed out that on numerous occasions, we use programs that perhaps don’t care how our filesystem is organised (so called Document Managers) - for example, iTunes acts a Document Manager. It just happens the documents are media files and it doesn’t care when you add a folder of music if it’s all in a single folder or in an artist/album/song hierarchy or what - it will sort of that out itself and let you concentrate on the music. 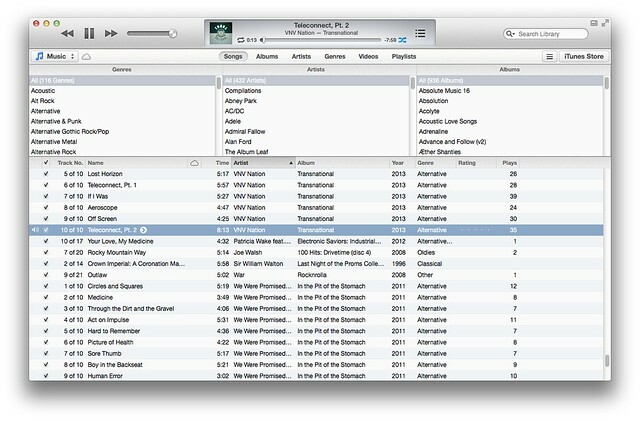 Basically, iTunes will let you browse by meta data of the files and it’s a lot more powerful than just filing the files away. Slowly, I’d been coming around to this way of thinking. I’m using Zotero to index and reference my academic papers, I’m using Calibre to manage my eBook collection and I’ve been playing with nValt for my notes (as well as Evernote which hides the file system from the user). Basically, I was beginning to rely more and more on document management software rather than the actual file system itself to maintain my documents and books. My initial thought was that if one of these programs stops development, I might be in trouble, however, in the meantime, the use of these is sufficiently helpful that it should offset any issues I have if I have to move away. Anyhow, if I was using these other programs, then perhaps I should investigate iPhoto a bit more seriously. Earlier this year I consolidated my photo folder. With the purchase of a digital camera, I decided that filing all the photos should be done by year and then month, just to keep things a bit more split up, rather than dump them in a single folder. 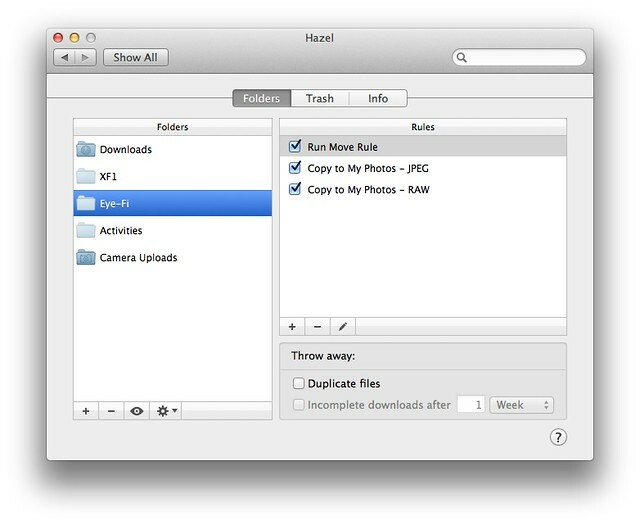 This is achieved by using Hazel to move images from either my Camera Uploads folder in Dropbox or on my camera SD card. The camera upload folder differs, as it has a step for sorting out PNG files - the outcome normally, of taking a screenshot on the iPhone. Currently, the Mac and iPhoto doesn’t support the RAW files my camera shoots so I’m still filing these. Any JPG’s from the camera are imported into iPhoto (unfortunately, this imports them one at a time and this creates a single event for every photo, however, that’s easily solved with some drag and drop later). As well as importing into iPhoto, it then moves the photo off the SD card (clearing space) and moving it into a folder based on the date (~/Pictures/My Photos/YYYY/MM). The RAW files do the same, but skip the iPhoto import. This meant I could run iPhoto and my filing system side by side for a while to get used to it. 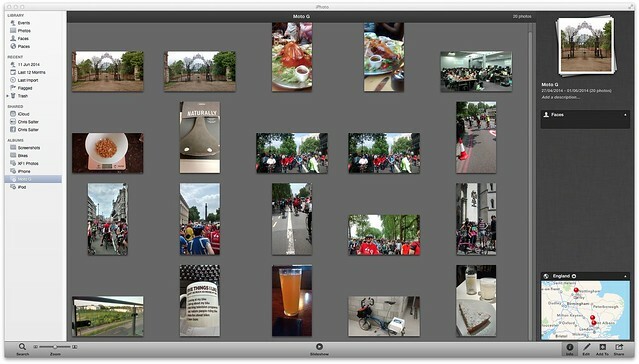 This would let me see if I liked how iPhoto worked and if it fitted into my routine. So with my photos being added into iPhoto as well as filing them in my own storing system, it’s allowed me to get to use iPhoto. And I can say that it’s very handy. The event page allows you to select the events that your photo’s are part of. Now I’m taking more pictures, this makes sense. However, previously, it seemed a bit pointless as I’d take a single photo here and there (and ones I wanted to remember, would end up in Day One anyhow. However, now I can see the benefit of it so it’s pretty handy to go back over and see a collection of photos for each cycle ride or event I’ve taken pictures at. Nice to be sorted within chronological order as well. The smart albums function is a nice twist that I’ve started using. It lets me create a folder of images based on the camera that has take the photo. For example, I can automatically sort folders based on camera phone shots or my actual camera. This is pretty handy. 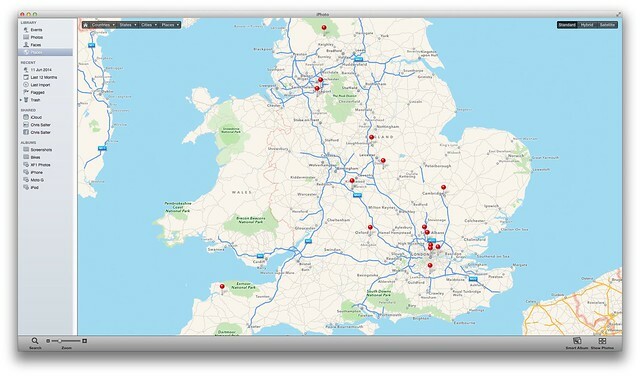 The geo-tagging feature is handy - it uses the embedded meta data to locate the images, though I don’t think the location is embedded into images that you can manually set the location for (however, I could mistaken about that). 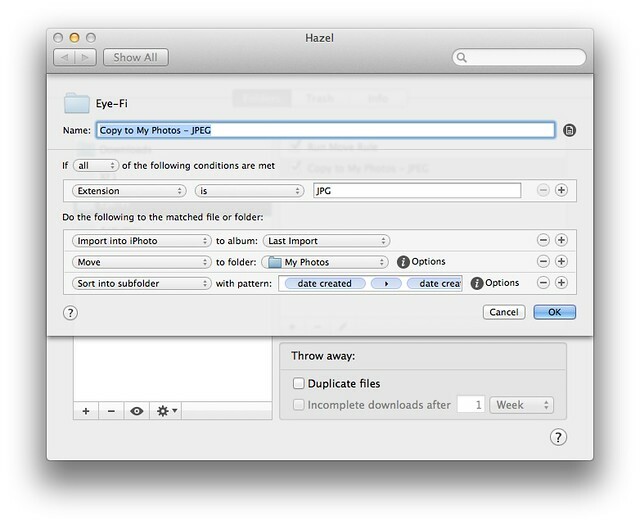 iPhoto takes care of the filing for me so I don’t have to bother (mind, with Hazel, that does the job for me as well). The fact that it integrates nicely into Facebook and Flickr is also helpful. It means that I can import all my images into iPhoto and then upload to them to either Facebook or into Flickr for integration into my blog (as Marsedit, which I’ve started using, integrates well with Flickr). Whilst it might not, on the front of it, appear to be the easiest software to use, it does what it’s supposed to do quite well. I’ll be using it more in the future.